Established in 2016, The IEEE Broadcast Technology Society and the Association of Federal Communications Consulting Engineers will award scholarships of up to $10,000 to promising undergraduate and graduate students attending accredited U.S. Universities interested in a career in broadcast engineering. Information and applications are available at http://afcce.org/scholarships/. Eligibility and selection process shall comply with procedures and regulation established in IEEE and Society governing documents, particularly with IEEE Policy 4.4 on Awards Limitations. Established in 1993 to recognize a student paper of exceptional interest and applicability to the field of Broadcast Engineering. Funding: Honoraria funded by the Clyde M. Hunt Memorial fund; administered by the IEEE Foundation. Travel and Symposium registration funded by the IEEE Broadcast Technology Society. Eligibility: Any student, undergraduate or graduate, pursuing a course of study in a field related to broadcast engineering is eligible. The student need not be a member of IEEE or BTS. the broadcast engineering profession. The paper must be of sufficient quality to warrant publication in the Transactions. Presentation of Award: Given periodically, however presentation to be made at Annual Broadcast Symposium. Established in 1957 to recognize the best paper published in the IEEE Transactions on Broadcasting.. Presentation of Award: At the following year's Annual Broadcast Symposium. 2014: L. Gui, S. Li, J. Xiong, and Y. Xu for their paper, “A Generalized Analytical Solution to Channel Estimation With Intersymbol Interference Cancelation and Co-Channel Interference Cancelation for Single Input Single Output/Multiple Input Single Output Digital Terrestrial Multimedia Broadcasting Systems. Established in 1982 the Matti S. Siukola Memorial Award recognizes the best paper presented at the Annual Broadcast Symposium. The award honors Dr. Siukola, an eminent broadcast antenna engineer for more than thirty years, who was stricken with a fatal heart attack as he completed his presentation at the 1980 Symposium. Funding: Funded by the IEEE Broadcast Technology Society. Eligibility: Presenters of papers at the Annual Broadcast Symposium. Basis for Judging: Overall technical quality, extent of original work, effectiveness of presentation, quality of visual aids. 2015: David Layer for "All Digital Radio AM Field Test Project"
2014: Benjamin F. Dawson, P.E. for "The Effects of Nearby Structures on MF Antennas and the FCC's Newly Enacted Rules for Protecting AM Stations from those Effects"
2013: S. Merrill Weiss for "Interference from Passive Intermodulation (PIM)-Keeping the Red Flag Flying"
2012: Greg Best and S. Merrill Weiss for "Taming DTV Interference to Co-Sited Adjacent-Spectrum Users"
2011: Geoff Mendenhall for "Transmission System Solutions to Increase IBOC Power and Coverage"
2010: Pascal Marcoux for "Revisiting the Field Strength Requirements for DTV in the Canadian Context"
2009: Robert Seidel for "Audio Loudness"
2008: David Plets for "Evaluation of Performance Characteristics of a DVB-H Network for Different Reception Conditions"
2007: Oded Bendov for "Interference to UHF-DTTV Channels by Unliscensed Devices"
2006: Andy Bater for "A Flat Earth DTx Implementation"
2005: Gary Sgrignoli for "Interference Analysis of Co-Sited DTV and NTSC Translators"
2004: Oded Bendov, Yiyan Wu, Charles W. Rhodes, and John F. X. Browne for "Planning Factors for Fixed and Portable Reception"
2003: Richard Citta, Xianbin Wang, Benoit Ledoux, Sebastien Leflèche, Yiyan Wu and Bernard Caron for "A VSB DTV Receiver Designed for Indoor and Distributed Transmission Environments"
2000: Robert Plonka for "Determining EVM/SNR in DTV Coverage Areas as a Function of Antenna Type - End, Center or Branch-Fed." Established in 2009 to recognize the best paper presented at the Annual IEEE International Symposium on Broadband Multimedia Systems and Broadcasting (Broadband Multimedia Symposium). The paper topic, research, presentation materials and presentation delivery will all be assessed. Prize: Plaque for the principle author, and certificates for the remaining authors (if any), plus complimentary registration for the following year’s Broadband Multimedia Symposium for the author accepting the award (year of presentation). Eligibility: All Presenters of papers at the IEEE International Symposium on Broadband Multimedia Systems and Broadcasting are eligible. Basis for Judging: Overall technical quality, extent of original work, effectiveness of presentation, quality of visual aids. Presentation: The Award will be presented annually at an Awards luncheon or dinner, held during the IEEE International Symposium on Broadband Multimedia Systems and Broadcasting in the following year. 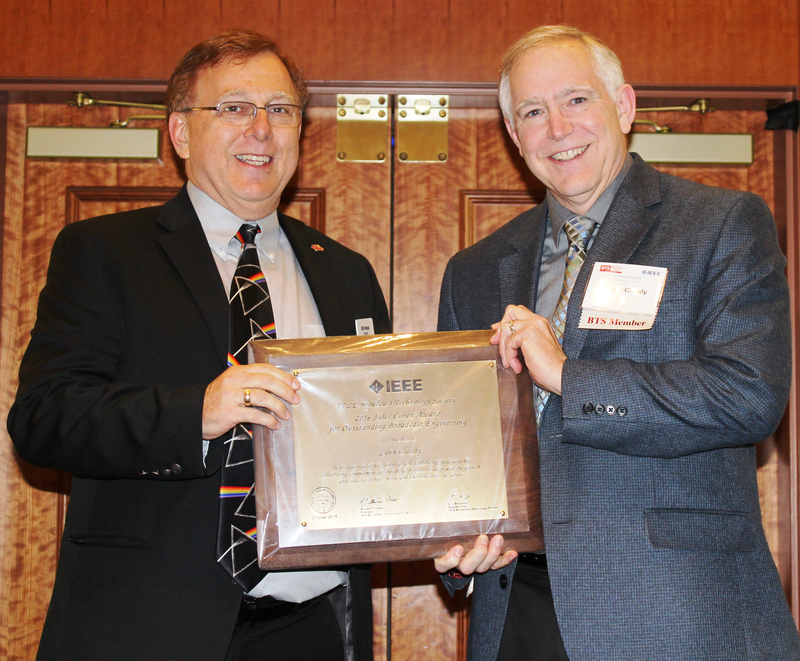 Established in 1981 to recognize outstanding service to the IEEE Broadcast Technology Society. Eligibility: Members of the AdCom (including members-at-large and ex officio members).